The other day I learned you can’t bring a ladder on Muni. I borrowed the ladder from a cross-town friend. 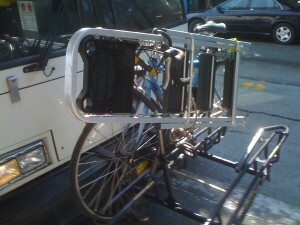 The 22 bus pulls up, I put my bike on the front, and walk up the stairs with the ladder, and flash my Fast Pass. The driver tells me that I can’t bring the ladder on the bus. Dumbfounded, I stare at him. He tells me it’s “too dangerous.” What?! Camouflaged, my ladder rode happily back to my apartment. The driver was probably imagining some Chaplin-esque antics with the ladder when it came time for you to turn around and get off the bus.